« Nice galaxy clusters: NGC 5982, 6946 and more! 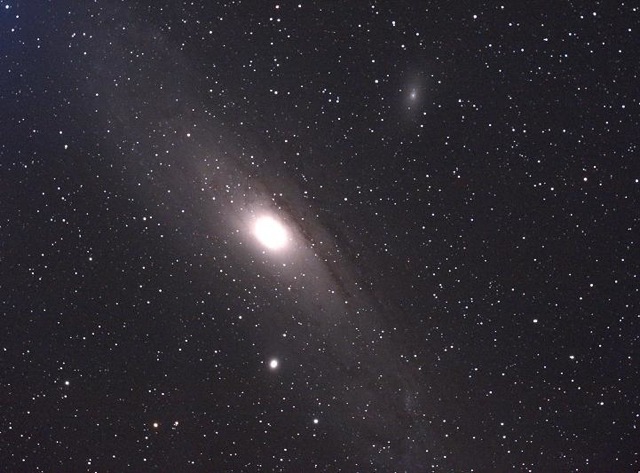 So we were lucky and got a good stint of good weather last week and I hit up one of my favorite targets, Andromeda. The sheer size of this galaxy across the sky still amazes me. Nearly six times the size of the moon in apparently size (viewed from Earth) and 2,700,000 light years away, this is the most distant thing you can see with your naked eye. Sadly, it’s coming towards us and eventually will merge with the Milky Way. This was about 20x 30s frames stacked. It turned out a bit monochrome-looking, so there’s more work to do to help the colors stand out, but I’ll probably grab new raw images before I do that. Anyway, enjoy. This entry was posted by admin on July 13, 2010 at 5:57 pm, and is filed under Astrophotography. Follow any responses to this post through RSS 2.0.You can skip to the end and leave a response. Pinging is currently not allowed.